You’ve got to give credit where credit is due. Car show builds are privateer efforts for the most part and people doing it just for the love of the hobby. This group of car fanatics meticulously build these magnificent showcases of technogadgetry on wheels and put them on display for the rest of us to admire. 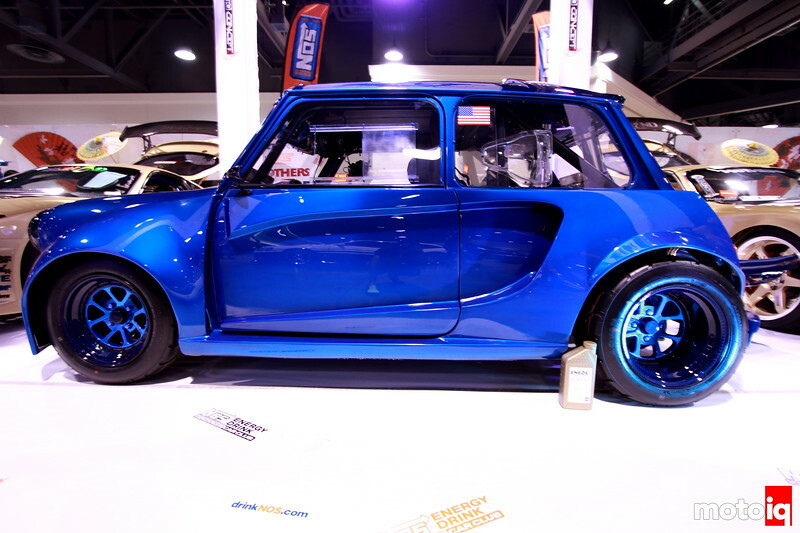 The craftsmanship and obsessive attention to detail on many of the cars at the Motion Autoshow ooze pride of ownership and a passion for the tuning industry that any gearhead can appreciate no matter what discipline you come from. 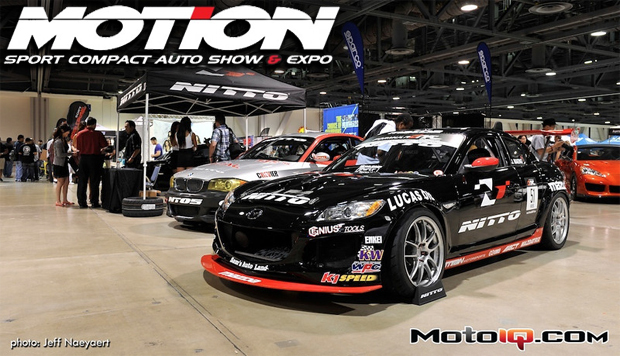 The Motion Autoshow is unique in the way that it is part car show and part industry demo day for aftermarket parts manufacturers. The show is centered on the tuner crowd and caters almost exclusively to the high performance sport compact segment of our industry. There are of course a few lambo door conversions to be found at the show but the vast majority of show cars are race car inspired builds or actual race cars. And if you happen to get stuck at the show with a friend who doesn’t like cars there is plenty of PG-13 stuff to look at with the dozens of girls roaming the show floor in their lingerie and string bikinis. Either way you cut it, the show has plenty of visual effects and we should give credit where credit is due. The multiple cut & weld style is something that the JDM tuners made popular for exhaust systems. Not surprisingly most of the exhausts that utilize this style are titanium systems since there are so few manufacturers who can properly mandrel bend titanium tube. The titanium manifold and exhaust setup on the blue Mini Cooper uses ultra tight bend radii and the workmanship looks impeccable. Here you can see the blue Mini Cooper’s ginormous side vents that feed fresh air to the titanium octopus in the back. 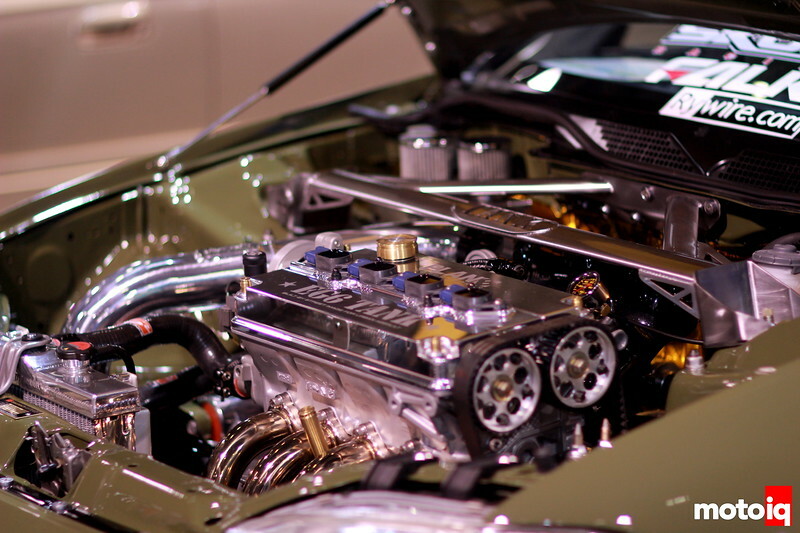 You’ve got to admit that the Honda B-series crowd have the cleanest engine bays around. The Honda engine bay guys have elevated their art to the point that the engine bays sometimes outshine the rest of the car. See what I mean? No doubt that this is a super fine example of a period correct CRX but the engine bay is what really shines here. There was no shortage of photographers creepin’ around the convention center floor for models… of course Jeff doesn’t count as one–he was only documenting this phenomenon.